So often, when my home country does something, people or government, I get questions about "why" that I don't know the answer to. "Why do Americans do this?" and "Why does the government do that?" So naturally, my default answer is, "Because America is the best country in the world!" Don't worry. I'm being completely satirical when I say this. It's a joke, a way of poking fun at myself, my people, my country. But do you know what? I actually want to say that Americans and Koreans have quite a lot in common, in this regard. Only Korean people are less outspoken about it and since the national language is not English, a lot less of what they do say actually gets translated for the rest of the international community to learn about. "Great Korean people, To the Great Korean way stay always true!" I have met many foreigners in Korea who have expressed surprise at the amount of patriotism among Koreans, but the roots of the patriotism are deeply embedded in so many aspects of life, here, and that fact has been a great contribution to their strength and resilience as a people for so long. I'd like to add that this patriotism and nationalism are still being very strongly pressed into their children, today. Korea is well known for its isolationism. The Korean people were not welcoming to new foreign peoples, and have been slow to change in that respect. Despite being an ancient people, they had little interest in creating a flag prior to the late 19th century. The Korean flag was first officially adopted in 1883, and then dissolved under Japanese occupation, but re-adopted near the end of Japanese rule. 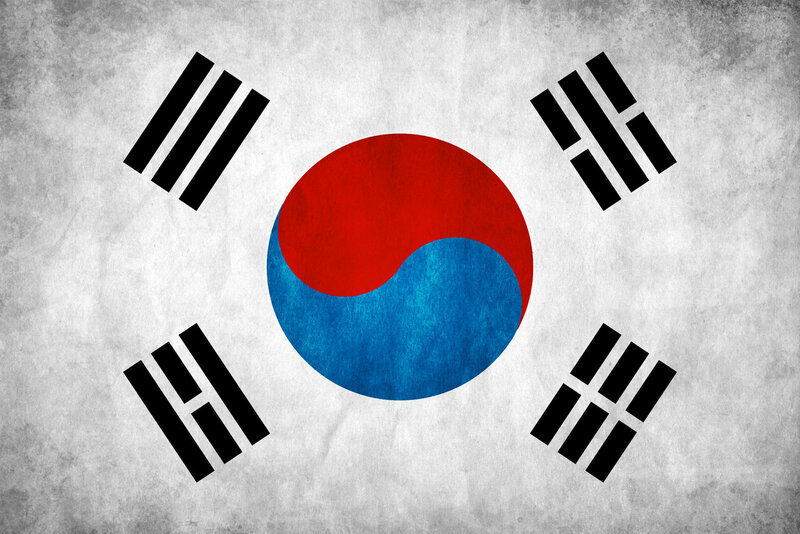 The Korean flag is known as "Taegeukgi" ("Dae-gook-ghee"), and it represents long standing Korean ideals and philosophy. The white symbolizes light and purity, and represents the Korean affinity for peace. The circle in the center that is divided equally into a blue portion below and a red portion above represents two cosmic forces, equal and opposite. It symbolizes universal harmony in which the passive and active, the masculine and feminine, form the whole. The black lines, trigrams, surround the circle, and represent several things each. UPPER LEFT is "Geon" (gun). It represents these things: sky, spring, east, humanity, father, and heaven. It means justice. UPPER RIGHT is "gam" (gomm rhymes with "mom"). It represents: moon, winter, north, intelligence, son, and water. It means wisdom. LOWER RIGHT is "gon" (gon rhymes with "tone"). It represents: earth of nature, summer, west, courtesy, earth the element, and mother. It means vitality. LOWER LEFT is "ri" (Lee). It represents: sun, autumn, south, justice, daughter, and fire. It means fruition. Now, imagine that the center circle is spinning, as though passing through the four phases. Altogether, the flag represents universal harmony and the ideals of the Korean people. I actually love the Korean national anthem. It is such a beautiful song. Unfortunately, I searched YouTube for a video that shows how beautiful it is, and I really couldn't find one good enough. But of the ones I saw, below is the one I liked best. The title of the Korean national anthem is "Aegukga" (Aa-gook-gah). It means "The Patriotic Song". God protect and preserve our country! so shall our resilient spirit.